I painted all of my nails with OPI My Boyfriend Scales Walls. Then I sponged China Glaze Riveting in a gradient on my thumb and ring finger, and in random places on the rest of my nails. I proceeded with a black striping polish and made random swirls on my nails. Then I used a dotting tool and China Glaze Riveting to add some dots. On all of my nails I added a coat of Essie Shine of the Times. On the accent nails I sprinkled some extra glitter and used the black striping polish to make the outline of a fish. The glitter ended up being quite gritty but combined with Essie Shine of the Times, these nails had a beautiful, almost duochrome sparkle. I also wanted to say thank you for the feedback on my new layouts! I'm glad you like them as much as I do (: Have an incredible day! Wow -these are beyond incredible! I love this! I think it's really awesome! You silhouette's really make me think of the fish Fantasia! It's in the Nutcaker suite part3. This is sososososo pretty! I love it!! What a brilliant design! You're right, the glitter looks very fish-scaley (in the best possible way! 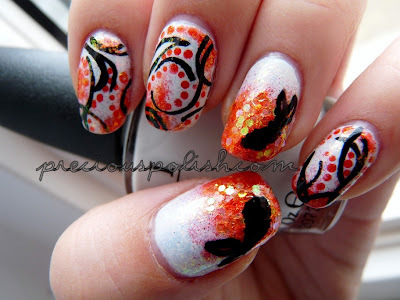 ), and even on the nails that don't have the fish themselves, the swirling lines totally suggest the tails and fins of the swimming koi. Super job on these! this has got to be one of my favourite preciouspolish designs yet :) nice work! As always, thank you thank you!! I would just die if you would make a tutorial for this! It is an amazing manicure! You definitely have a new follower here! I am so impressed with your works!